Sheetla Ashtami (March 28, 2019 Thursday) also known as ‘Basoda Puja’ is celebrated on ashtami (eighth day) of Krishna Paksha in Chaitra month (April-May). It is the day of Goddess Sheetala celebrated eight days after Holi or on the first Monday or Friday after Holi. Popular in Gujarat, Uttar Pradesh and Rajasthan, Sheetala Ashtami is considered as an auspicious day to worship Goddess Sheetala, an incarnation of Goddess Durga. People perform Basoda Puja on this day in order to worship and please the goddess. The Tithi starts in the early dark morning at 8:55 on March 27 (Wed) and ends in the evening at 10:34 PM on March 28 (Thurs). You can perform Basoda ritual between 6:25 AMand 6:29 PM on March 28. It is the most auspicious puja timing. It is believe that Goddess Sheetala Devi cures diseases like Smallpox, Chickenpox, Measles and the like. Families worship her for the protection of their children against these diseases. In the state of Gujarat, the locals celebrate a similar festive day known as Sheetala Satam a day before Krishna Janmashtami. On this day, cooking gas is never run. People prepare food items on the previous day and have them on Sheetala Ashtami. 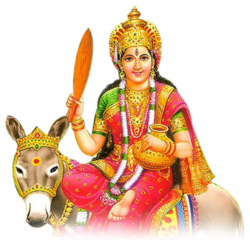 How to Celebrate Sheetala Ashtami: What to do? "Ganga Cha Yamuna Chaiva Godavari Saraswati, Narmada Sindhu Kaveri Jalesmin Sannidhim Kuru"
After your bath, visit a Sheetala temple. In case of no temple, you can worship her at home by installing her deity picture. One can also have a deity picture of Goddess Durga as Sheetala is an incarnation of Durga. Light up an oil lamp, incense sticks and focus on her lotus feet. Offer her Rabri or curd and recite Basoda Vrat Katha, shri Sheetala Mata Chalisa, Sheetala Maa ki Arti, Shri Sheetala Mata ashtak and the like. Offer the food items that are prepared the previous day to her. Once the offering is made, distribute the food items as prasadam. One can also use a Durga Pendant on this day for protection of your home, office or vehicle. One may listen to Durga Prayers on this day as it spiritualizes the atmosphere on this day. Goddess Durga incarnated as Katyayani, daughter of Sage Katyayan and protected the village against the atrocities of demons led by Kaalkeya. When one of his demons named Jwarasura infected the village with diseases such as dysentery, smallpox, chickenpox and cholera, Katyayani protected her young friends (children) from the diseases. But when the spread of intensified, she assumed the form of Sheetala Devi who held held a short broom, winnowing fan, jar of cooling water and a drinking cup and wiped out the diseases. Later, She asked Her friend Batuk to stop the demon Jwarasura who killed him in a battle. The demon was surprised to see the body of Batuk turning into dust. Later on, Jwarasura meets a fierce figure with the three-eyed face, four arms holding a battle-axe, sword, trident and the demon heads. Being dark in color, He had a garland of skulls, frightening Jwarasura. When Jwarasura inquired from Him about His identity, He called him muddha (fool) and asked him to surrender unto the feet of Goddess Katyayani who is none other than Durga. Realizing that it is Batuk who assumed the form of Shiva, Bhairava, he aggressively started fighting. Bhairava with His cosmic Trident beheaded the demon. The entire village was filled with auspiciousness.